Onstage power couple, Kendra Kassebaum and Peter Saide, put on a formidable two-person performance in Village Theatre’s I Do! I Do!The play begins the day they are wed in 1895 and ends fifty years later in 1945. In-between we glimpse personal and often funny moments as well as insight into each partner’s perspective and emotions as characters Agnes and Michael deal with the timeless nuances of marriage. Although the setting is historical, the rhetoric and situations are ultimately just as relevant to present-day relationships. But it is other aspects of this play that make it truly remarkable. 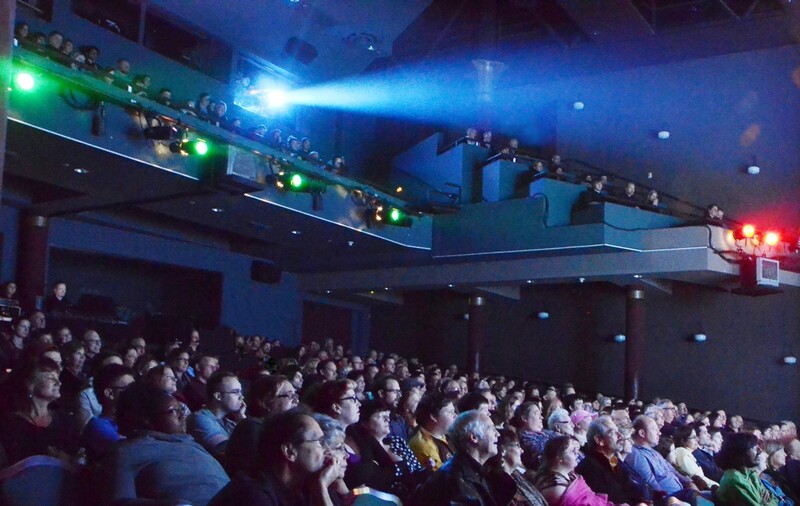 The audience at Francis J. Gaudette Theatre. Photo courtesy of Village Theatre. The opening night performance was extraordinary. Members of the audience and I were either laughing or completely silent, fully engrossed in the lives of the characters. I purposefully came to the play knowing nothing of the story in order to have a fresh viewpoint. Near the end of the first act, I realized that Kendra and Peter’s two-person performance felt like that of an entire cast. Other characters were woven into the story in such a way that the mere mention of them brought them to life. I could almost see the priest and wedding-goers in the church and I just knew the baby was playing as her mother tidied up. At the beginning of the play, two young people stood on the stage saying, “I do!” At the end, two elderly people hobbled away. 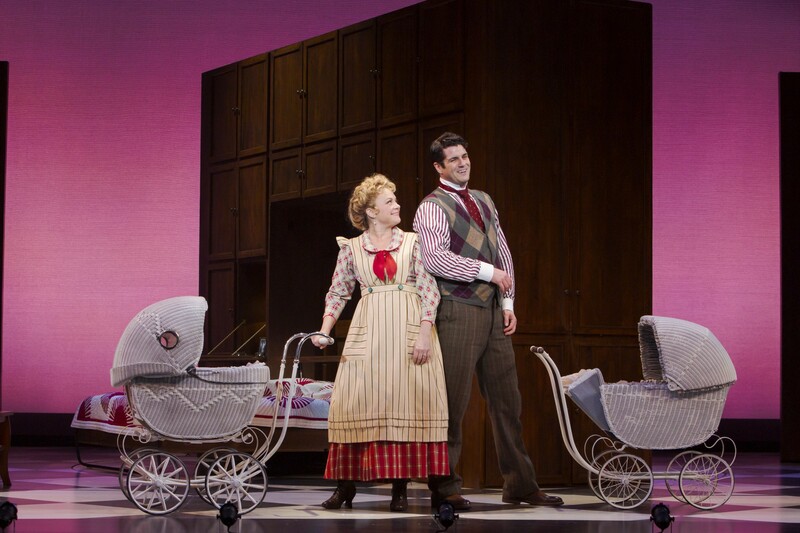 Wardrobe and makeup changes seemed to happen almost entirely onstage and yet, Agnes and Michael aged. How? The actors, subtly and convincingly, grew old?—?slight changes in posture, gait, speech and costume combined to simulate the passage of time, a tribute to the actors’ talent. A transforming set and talented actors. Photo courtesy of Village Theatre. The original Broadway play’s set was wholly in the couple’s bedroom. Village Theatre took a similar, yet at the same time, entirely different, approach. Three separate sets of moving cabinets provide an endless supply of furniture on demand as well as partitions when needed. Just as the set for Matilda was brilliant in its use of sometimes larger-than-life symbolic backdrops, the cabinet set for I Do! I Do! is brilliant in its pure functionality. 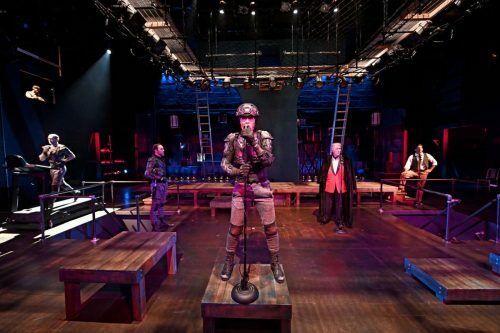 I would love to meet Master Scenic Artist Julia B. Franz and Scenic Designer David Sumner, who are likely fans of Swedish furniture design and Transformers. The end result of this set style is that at any point during the evening, it can be any room at all simply by closing one cabinet door and opening another. Incredible. 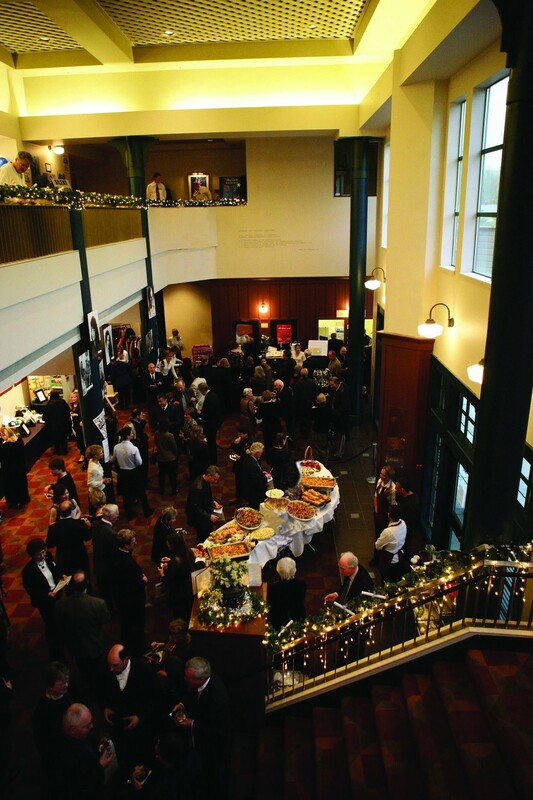 The lobby of Francis J. Gaudette Theatre. Photo courtesy of Village Theatre. After feeling every emotion possible, I sighed as the play ended and it was time to rehash it all with my husband. It made us both contemplate deep topics like the fleeting nature of life our gratitude for each other. I Do! I Do! is playing at the Francis J. Gaudette Theatre in Issaquah, Washington now until February 24, 2019, then at the Everett Performing Arts Centerin Everett, Washington March 1–24, 2019. Watch the play for entertainment, insight and to enjoy the talent. A big “thank you!” to Ann Reynolds for her help. Ann, Village Theatre is lucky to have you! Lina (Kimberly Gilbert) and Roberto (Marcus Kyd) star in the Playhouse in the Park’s world premiere production of “The Last Wide Open,” written by Audrey Cefaly. 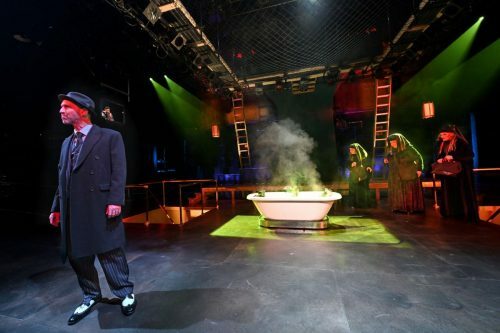 The show runs in the Shelterhouse Theatre through March 10. (Photo11: Provided photo, Mikki Schaffner)? There is something wonderfully effortless about “The Last Wide Open,” which had its world premiere at the Playhouse in the Park Thursday evening. That’s not a very compelling description, I know. But it’s a compliment. You see, Audrey Cefaly’s play defies all those laws of time and logic that we grew up with. It’s a play that should, by all rights, be utterly confusing. And, I suppose, if you’re one of those people who insists on grasping every last shred of reason out of a script, it still can be. But why would you go to the theater and battle the playwright? This is the person you’ve asked to take you on a journey. Give in. Trust your playwright. Give yourself a chance to be enriched by the ride. And what an enchanting ride Cefaly and her cast – and director Blake Robison – take us on. It all takes place in a small Italian restaurant called Frankie’s. There are just two characters; Lina and Roberto. He’s an Italian immigrant, while she is someone always wanting something she doesn’t have. That has the makings of a story. But Cefaly isn’t content with that. She’s leading us into an adventure. “The Last Wide Open,” you see, is more than a love story. It is three variations on the same story. All three take place on the same day in the same place. What does that mean, exactly? Well, in the first section of the play, Roberto has spent five years as a dishwasher at Frankie’s. In the second, he’s still the same man, but he is a teacher who is helping out at his uncle’s restaurant – Frankie’s. In the third, he is a bus boy who has only just arrived in America. We meet three different faces of Lina, too; as an impatient, directionless server, a nurse and finally, a part-time server who is a week away from being married. Confused? Probably, because this sounds much more complicated on paper than when it is played out in front of us. Cefaly has created characters who are, in many ways, just like the rest of us. Sure, there are actorly demands. But Lina and Roberto are people coping with anxiety, longing, uncertainty and the greatest burden of all, trying to find meaning in the humdrum of everyday life. Is there sadness? Definitely. And apprehension and anger, too. And love? We hope there will be, because by the time we’re a few minutes into the play, we really like these characters. A lot. Kimberly Gilbert (Lina) is a bundle of . . . well, I was going to say “nerves.” That’s true. But there is so much more. Not only does she feel immobilized by the pressures of life, but she is also in a constant dither. Her greatest pride, it seems, is in the precision with which she mops the restaurant floor. And as Roberto, Marcus Kyd seems unflappable, no matter how muddled and chaotic the situation around him. Perhaps he has learned that, as a man with only a rough understanding of English, the safest way to proceed is to smile a lot. And nod occasionally. And be charming. Oh – there is one more person on the stage, as well. Debra Hildebrand is the chief of the theater’s properties running crew. She’s the one in charge of making sure all that “stuff” on the stage is in the right place at the right time. Usually, the role would have her hidden backstage. But Cefaly wants everyone to be a part of the mix. 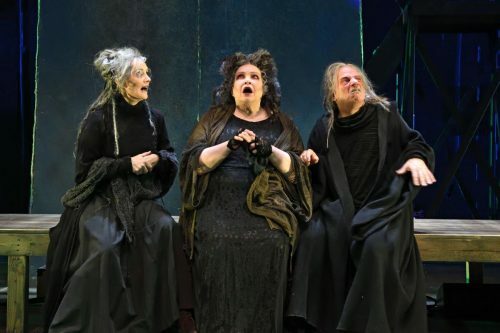 So Hildebrand wanders in and out at significant moments, moving errant forks or handing the actors musical instruments – just being there when she’s needed. And she has a lovely presence, like a favorite aunt wafting in and out of the room. There are a handful of songs, too. Written by Matthew M. Nielson, they’re not big musical numbers. They’re more like musical ruminations, except that they’re funnier and more clever than that description makes them sound. “The Last Wide Open” is much harder to describe than it is to experience. Remember, it’s “effortless,” even in its unusual dramatic format. Should it be three separate plays? Played by separate actors? Who knows? That’s up to Cefaly. And the world she chooses to wrap us all up in is one that manages to be mystical and real. And charming. As I mentioned earlier, trust her. And trust her writing. And while you’re at it, trust her characters, too, no matter where they take us. Read the full review from the Cincinnati.com here. 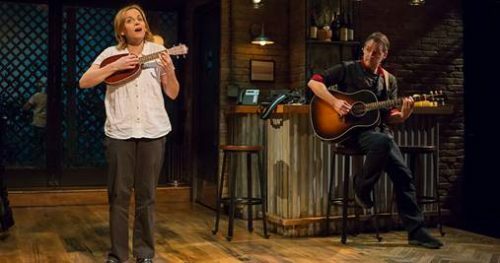 See what is playing at the Cincinnati Playhouse here. 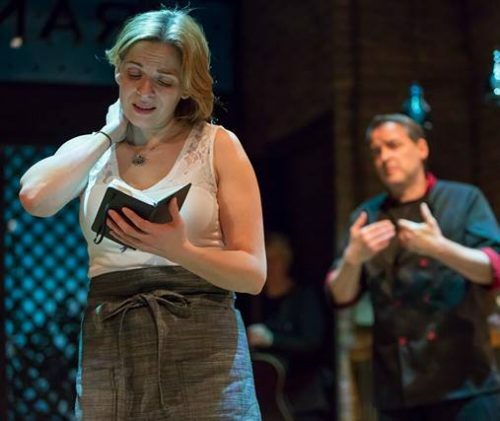 Cincinnati Playhouse in the Park will present THE LAST WIDE OPEN, a love story that encourages audiences to take a personal, humorous look at modern-day courtship, romance and relationships, just in time for Valentine’s Day. It begins Feb. 9 in the Shelterhouse Theatre and runs through March 10, with support from The Rosenthal Family Foundation, Season Sponsor of New Work. Opening night is Feb. 14. The world premiere, under the direction of Artistic Director Blake Robison, was written by Playwright Audrey Cefaly and described by Cefaly as “a love song in three movements.” This romantic tale sweeps the audience up into three different realities in which the same characters attempt to forge a connection despite language barriers, personal stories and histories, and cultural differences. 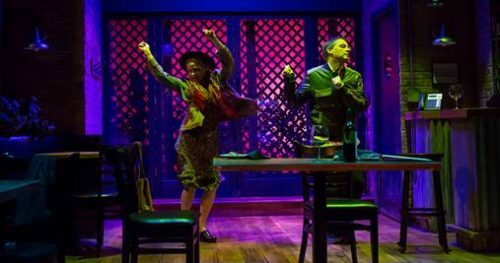 The production, which features original songs with lyrics by Cefaly and music by Composer/Sound Designer Matthew M Neilson, follows Lina, a waitress, and Roberto, an Italian immigrant. The two find themselves on completely different paths of their own creation giving the show an element of fantasy. THE LAST WIDE OPEN takes place in the twilight hours of an ordinary night on a normal day during a thunderstorm. The date is May 5, present day. The location is Frankie’s, a small Italian restaurant that is closed for the evening. Two characters, Lina and Roberto, enter onstage. She is an emotional person and a dreamer. He is a poetic and generous Italian immigrant. They are about to share their fate-filled love story – imagined in three different realities.